In Situ Hybridization - Comparative Biosciences, Inc. In situ hybridization (ISH) is a technique used to detect and localize the presence or absence of a specific genetic sequence in tissue using a probe with a complementary polynucleotide sequence. We offer both fluorescent (FISH) and chromogenic (CISH) in situ hybridization assays, which are available on formalin-fixed, paraffin embedded tissue slides. Dentaturing and hybridization of probes are maintained using an automated Dako Hybridizer. 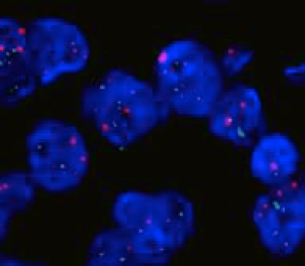 Fluorescence in situ hybridization (FISH) uses fluorescent probes that bind to only those parts of the chromosome with which they show a high degree of sequence complementarity. Fluorescence microscopy can be used to find out where the fluorescent probe is bound to the chromosomes. Chromogenic in situ hybridization (CISH) is a cytogentic technique that provides genetic information in the context of tissue morphology using immunohistochemistry techniques. Consultation on probe design and experiment design. Probes will be designed using proprietary algorithms developed by experts, which allows for the best results in the most cost-effective way. FISH quantification of HER2 assay for breast tissue. The chromosomes can be seen in blue. The chromosome that is labeled with green and red spots is the one where the rearrangement is present.